Barbara Browning received the New Adult Educator of the Year award on April 26. Bloomington, Ind. 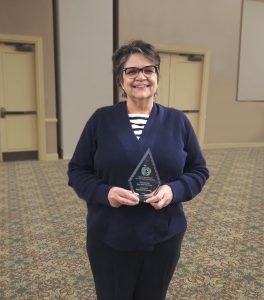 – Yesterday, Barbara Browning was named the 2018 New Adult Educator of the Year by the Indiana Association for Adult & Continuing Education (IAACE). Browning is being recognized for helping 28 students from Cook earn their High School Equivalency (HSE), which made them eligible for full-time employment with the company. Each year, this award is presented to an educator with less than three years of experience in adult education and who has made significant contributions to the field. Browning began working with Cook students in 2016 when Cook Group launched the education assistance component of My Cook Pathway. Cook’s partnership with MCCSC’s Broadview Learning Center for adult education allows employees to work part-time at Cook while earning their HSE diploma. Once they complete the program and earn their diploma, graduates are then eligible for full-time employment. Browning earned a B.S. in Education from Indiana University-Purdue University Fort Wayne and holds two master’s degrees from Indiana University in Public Affairs and Environmental Science. In 1994, she began teaching science at Crispus Attucks Middle School in Indianapolis, IN. Her career in Bloomington started in 2002 when she taught environmental science before she began teaching at Broadview Learning Center Adult Education in 2010. Since the 2016 inception of the My Cook Pathway, Browning has been the first and only instructor for Cook’s HSE program.